5 Players minimum with the area being as large or small based on the age/ability of the players involved. Player A, plays OUT to Player B, who plays BACK to Player A. Player A then plays a THROUGH pass to C, accelerates past Player D, to receive a wall pass and plays a 1-2 pass back to Player D and takes his/her position. 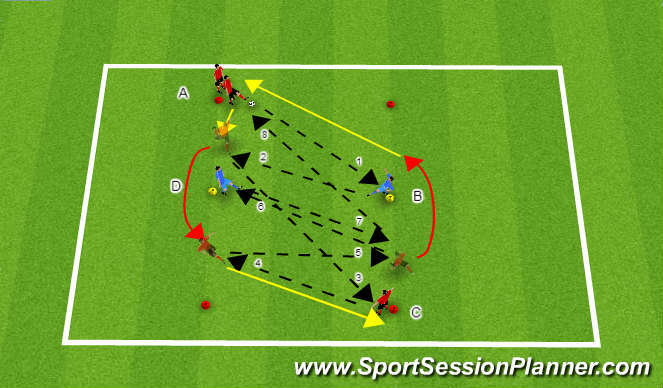 Player D then repeats the passing sequence the opposite direction by passing OUT to Player D, who passes BACK to Player D, who then plays THROUGH to the next Player in the line.